Traveling friends – I have to share these great new books with you. Everyone who knows me, knows I love to explore a city on foot. Often the walks I take are my best memories. But I don’t want to waste my time in unattractive or unsafe areas. Two California travelers have teamed up and written about their favorite walks in San Francisco, Paris, New York, London and Chicago in a series of Power Hiking books. They are organized by neighborhood, with detailed maps and color photos on every page. For my trip to New York City next week, I’m carrying along their pocket size guide (only 6″ square)to fourteen great walks through the parks, neighborhoods and by iconic buildings of Manhattan. First walk on my list is: The Highline, on the north side of Greenich Village, where elevated trains used to run, is now a linear greenway high above the city streets. Starting in the Meat Packing District, it extends into Chelsea and along the Hudson River. If the weather cooperates, my second walk will follow Chapter 13; Uptown through Fort Tryon Park, The Cloisters, Columbia University, Morningside Park, and Uptown Broadway. The authors, Carolyn Hanson and Cathleen Peck, have walked every step and documented the history, art, architecture and world-renown restaurants. How did they do it? Carolyn takes the photos with a digital camera and Cathleen measured the distances with a hand-held GPS. The walks can be divided into less strenuous excursions with more time devoted to wandering through museums, parks and historical monuments. Bravo Carolyn and Cathleen for writing, self-publishing and marketing, in my opinion, FIVE STAR guidebooks. 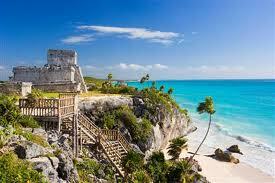 Where is the Riviera Maya and Why go? 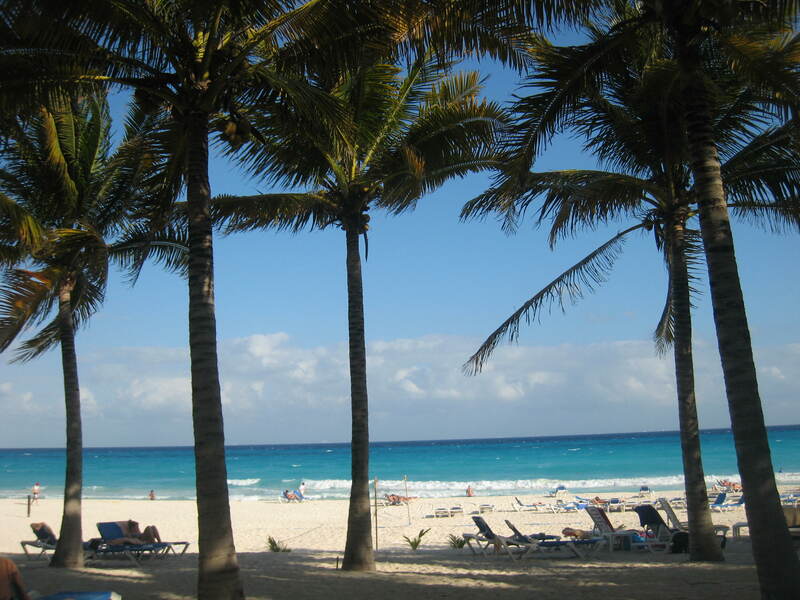 For pure alabaster white sand, turquoise-blue water, and a seamless vacation of R&R, you should know about the Riviera Maya; a strip of coastline stretching south from Cancun, on the Gulf Coast of Mexico, to the Mayan ruins of Tulum. And, due to the large number of all-inclusive hotels, there are fabulous deals for serious sun-worshipers for a week or a quick getaway. Although the coast no longer has small fishing villages or undeveloped jungle, the beaches are delightful, with warm water, sea breezes and easy living in resorts that are gated, guarded, safe and clean. Recently I took my daughter, as a graduation gift, to the luxurious Riu Palace near Playa del Carmen, the hippest city along the coast. It was the perfect place for a mother/daughter trip. We saw numerous groups of women, boomers, and honeymooners. The Riu Resorts were voted the best all-inclusive hotels in the world in 2011. Now I understand why. 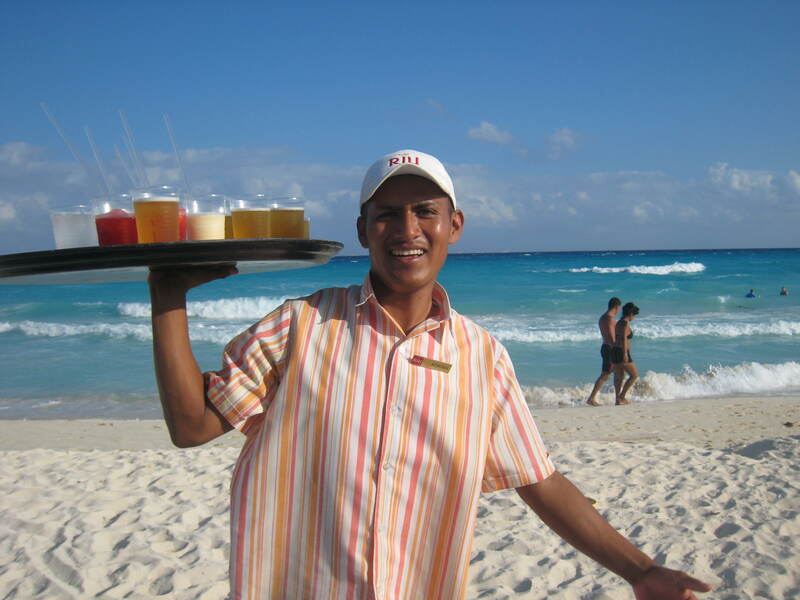 The Palace offers personalized service (IE: waiters on the beach delivering you the free margaritas, strawberry daiquiris, beer or whatever drink you desire). It’s hard to grasp the concept that a resort will include all food, specialty restaurants, evening entertainment, all alcohol for such a reasonable package price. 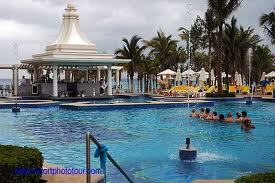 The chic Europeans, Brazilians, wealthy Mexicans and Canadians have discovered the Riu. Check their website for amazing deals. For example, a fellow from Washington DC obtained an off-season 6-night (7 day) package, including air, all food, all alcohol and transfers from Cancun for $ 1400. 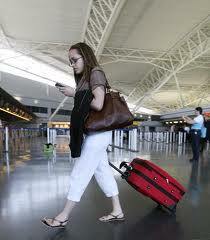 He calculated that the daily rate, without airfare, was $130-a-day. The price is right and the level of luxury and service is amazing. The area has a significant Mayan legacy, with important pyramids (check out Tulum and Coba) and cenotes – sinkholes and water bodies used by the ancient settlers of Yucatán. Nowadays they are very popular for diving and snorkeling. 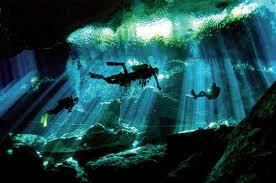 It’s a thrill to take a ladder down into the earth and then swim through the multi-colored cenotes. 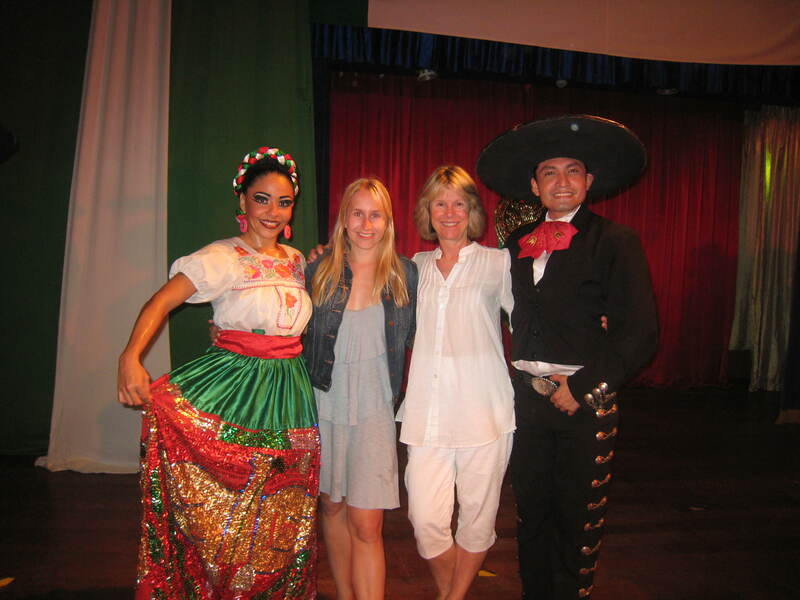 And fantastic nightlife, excellent golf courses and delicious gastronomy await you in Playa del Carmen. You’ll eat better than you do at home; steaks, fresh fruit (papaya, mango, pineapple, watermelon), salads, salmon, jumbo prawns, seafood and elaborate desserts. At the Riu Palace, we dined in all the Specialty Restaurants where we were greeted with champagne, (or saki in the Japanese Restaurant). I couldn’t pass up the chocolate fondant (warm brownie with warm liquid chocolate center, served with ice cream). At night, it’s all about music, dancing or quiet walks on the deserted beach. After a couple of hours of dancing, we finished off the night with a fresh mint and lime mijito at the bar in the palatial lobby, under dangling crystal chandeliers. We chatted with international guests before heading to bed tired and sun burnt. 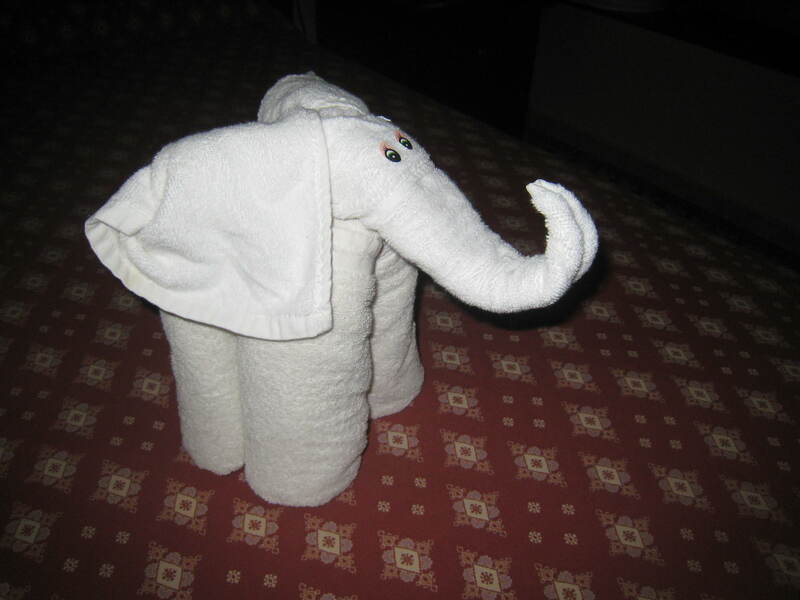 We were eager to see what towel art would await us in the room. And what do guests love, in addition to the service, great food, luxury accommodations and stunning beach? Included in the price are all the drinks you want, opulent buffets open all day, mimosas for breakfast, wine or beer for lunch and dinner. All that said about the night life and drinks, guests include boomer couples, multi-generational families and couples with small children who were having a great time. One thing we all had in common; we were having a blast. Hawai’i Island, Hawai’i (Mar. 8, 2011) – Kīlauea volcano’s new eruption site, which suddenly cracked open on Sat., Mar., 5, continues to spew lava through fissures on its east rift zone, following the dramatic collapse of Pu’u ō’ō crater’s floor. Fiery curtains of orange lava – some as high as 80 feet – have been captured on video and in photographs the last few days, shooting up from fissures that extend more than a mile between Nāpau and Pu’u ō’ō craters. The eruption is in a remote area of Hawai’i Volcanoes National Park and is not accessible to the public. While the park and most of its popular overlooks remain open, HVNP has closed Chain of Craters Road, all east rift and coastal trails, and Kulanaokuaiki Campground for public safety. Park rangers are sharing the latest real-time videos, photos and information at Kīlauea Visitors Center and Jaggar Museum, much to the delight of visitors to Hawai’i’s largest national park. The Federal Aviation Administration reduced the temporary flight restriction (TFR) above the newly active fissure area on Mon., Mar. 7, making it easier for flight-seeing passengers to get a bird’s eye view of the molten lava from 1,500 feet above. Residents in neighboring towns like Mountain View reported seeing a reflective red glow from the lava in the clouds on Sunday night. “It’s definitely an exciting time to visit Hawai’i Island and our World Heritage Site. Hawai’i Volcanoes National Park has always been a must-see experience for visitors,” said George Applegate, Executive Director of the Big Island Visitors Bureau. “It’s a perfectly safe experience to enjoy our changing volcanic action if visitors heed Park and Civil Defense officials,” he said. Pu’u ō’ō is not the only crater on Kīlauea to “bottom out” recently. At Halema’uma’u crater, the previously rising lava lake within the vent suddenly dropped over the weekend. A brilliant red glow is sometimes visible after dark, and rocks continue to cascade down crater walls, creating occasional-to-frequent loud rumblings audible from the overlook at Jaggar Museum. Orlando said that park visitation is up, but that it’s difficult to attribute the increase to one specific source, such as the recent volcanic events, an improving economy, or the start of a vigorous Spring Break season. Outside of HVNP boundaries and down near sea level at the County of Hawai’i’s Kalapana Lava Viewing Area, the flow has temporarily halted its march across the surface towards the ocean. On the evening of Sat., Mar. 5, molten lava was very visible on the pali (cliffs) and coastal plain, tantalizing onlookers as it disappeared and reappeared through an underground network of lava tubes. County officials reported there was very little if any molten lava visible from Kalapana on Sunday and Monday. However, a significant red glow from the new fissure activity was illuminating the clouds after dark. Conditions near the viewing area can change at any time depending on the direction and volume of the lava flows. That’s part of the thrill – this isn’t Disneyland. The area will be closed if visitors’ safety is ever in doubt. When conditions are right, the popular Kalapana viewing area boasts not only stunning vistas of the planet birthing, but also convenient parking and port-a-potties. And admission is free. Currently, viewing and parking hours at the Kalapana overlook are 2 p.m. to 10 p.m. daily. Visitors must be parked by 8 p.m.
For the latest conditions at Hawai‘i Volcanoes National Park, visit www.nps.gov/havo or call (808) 985-6000. The latest information for the County of Hawai’i Kalapana viewing area is available on the Lava Hotline: (808) 961-8093. Where’s the largest Irish Event west of the Mississippi? San Francisco’s St. Patrick’s Day Parade & Festival is the largest Irish event west of the Mississippi, which certainly merits a sip of Irish coffee or a romp through the Oxalis (which is a fancy word for shamrocks). “Giving Back” is the theme for the 160th annual St. Patrick’s Day Parade & Festival. The parade is one of a series of events which commenced on March 4 with the raising of the Irish flat at City Hall and extend through March 25, 2011. On Saturday, March 12, the St. Patrick’s Day parade will begin at 11:30 a.m. from Second and Market streets; more than 100 floats, Irish dance groups, marching bands and thousands of participants will make their way down Market to the reviewing stand at Civic Center Plaza. For information visit www.sfstpatricksdayparade.com. They’ll be representing more than one million Irish descendents in the Bay Area and some four million statewide. Grand Marshals Maureen and Mike Moriarty are being honored for their contributions to the Irish community. The festival in Civic Center Plaza on March 12, 11 a.m.-5 p.m., will include Irish cultural and retail booths; a “healthy” selection of Irish food and beverages; Irish dancing; live music; children’s activities such as pony rides, and a number of community enterprises. For information visit www.sresproductions.com. The eighth annual Crossroads Irish-American Festival, through March 25, will feature literature and oral history. The 21-day festival includes 11 events. Among the highlights are a walking tour illuminating the history of San Francisco’s famed waterfront with an emphasis on Irish-American workers on March 19, and a concert by Patrick Ball, one of the world’s premiere Celtic harp players and a captivating spoken word artist, at St. Patrick’s Church, 756 Mission St., on March 25. St. Patrick’s Church is celebrating its 160th anniversary in 2011. There will be additional events for the anniversary celebration; for details visit www.spcsf.org. Complete details on all Crossroads events are available at www.irishamericancrossroads.org. Visitors are encouraged to walk, bike or take public transit to all events. For regional transit information, telephone 510-893-8729, call 511 within the nine San Francisco Bay Area counties or visit www.511.org. For information on public transit within San Francisco, telephone 311 or visit www.sfmta.org. Wear green and each of these sightseeing firms will give riders $5 off each ticket purchased; not valid with any other offers. March 17, 9 a.m.-10 p.m.
Wipeout will be offering corned beef sandwiches all day. March 17, 11:30 a.m.-11 p.m.
An Irish-themed menu offered all day; evening entertainment from 7-10 p.m. features Claddagh with Shana Morrison, Kevin Brennan and Grant Walters. March 17, 11:30 a.m.-12:30 a.m. Celebrate St. Patrick’s Day in one of San Francisco’s most famous bars and enjoy a St. Patrick’s Day special — a delicious corned beef sandwich and a Guinness for $20. March 17, 6-9:45 p.m. at SFMOMA, cocktails at XYZ Lounge until 1:30 a.m. This St. Patrick’s Day sip on a whiskey cocktail or a dark, frothy Guinness, and take in a bit of Irish culture at the greenest museum on Earth, the California Academy of Sciences. Cast in an ethereal green light, NightLife will feature Irish step dancing, and performances on the Celtic harp and nyckelharpa, a lyrical instrument with 16 strings and 37 keys that has been around for more than 600 years. Music by DJ Nako. Join the more than 300,000 people who follow SF Travel on Facebook at www.facebook.com/onlyinsf. Follow “OnlyinSF” on Twitter at http://twitter.com/onlyinsf. Ford Francis Copola Winery in Alexander Valley, Calif. There is still room at the table on the terrace overlooking the vineyards of Alexander Valley at the newly opened Francis Ford Coppola Winery restaurant near Geyserville. The 88-acre property of rolling land includes sustainably farmed vineyards and embraces bucolic views from the terraces, tasting rooms, movie gallery, pools and bocce ball courts. Recently on a foggy day, my husband and I drove north from San Francisco into the sun in Alexander Valley. The clouds lifted and we lingered for a tour, free tasting and a long, languorous lunch on the patio overlooking the picturesque vineyards. What could be better? We dined and sipped for hours in the timeless tradition of Italian good living. Rustic, the new restaurant in the vineyard, offers international as well as traditional Italian dishes, with an emphasis on family-style cooking that features fresh, seasonal ingredients sourced from the property’s organic herb and produce garden. Authentic, cracker-crisp Neapolitan-style pizzas are also a specialty. We indulged in several of Francis’ favorites: Argentine short-ribs (grilled to perfection from a center-stage authentic, wood-burning parrilla, or Argentinean grill), a classic Caesar salad, and a show stopping Mrs. Scorsese’s Lemon Chicken with goose-fat roasted potatoes. The unpretentious, welcoming staff wants you to feel like a family member in the true Italian tradition. The masterful Chef de cuisine is Nick Petrilli formerly of Bottega and Tra Vigne. For evening dining al fresco, overhead heaters keep you comfortable even as breezes blow over the vineyards at sunset. Indoor seating is also available. There’s no question that the Godfather director was intimately involved with every detail of the massive remodel of the former Chateau Souverain, all the way down to the placement of the two swimming pools, “Cabinitas” poolside, bocce ball courts and the family recipes on the menu. 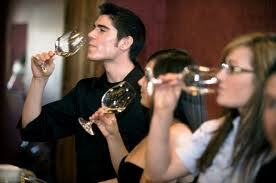 There’s more than wine and food to entertain you for an afternoon. 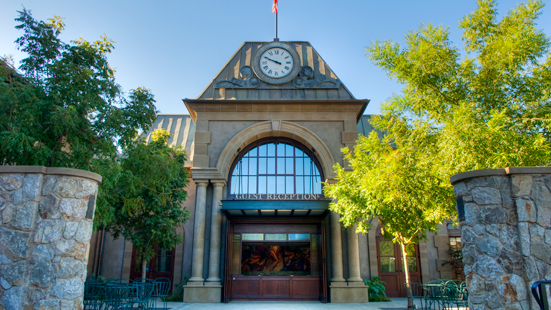 One of our favorite attractions at the winery is the Movie Gallery, displaying a vast collection of authentic movie memorabilia. Francis’s film making career spans five decades, which means there are some amazing items to explore, including several Academy Awards, Don Corleone’s desk from The Godfather, and the original automobile from Tucker: The Man and His Dream rotating impressively on a showroom turntable. Much of the memorabilia is integrated throughout the property so that you can enjoy it all while you taste wine, peruse the retail merchandise or make your way to our restaurant. While there is still some outdoor construction going on, the vineyard resort looks and feels fabulous. The pool area will be a strong attraction for families when it’s finished late this fall with 20 or so “Cabinitas” for guest privacy as well as a pool café. tissue to touch anything in the bathroom. Don’t put your head down on the food tray to sleep, or put your bread or snack directly on the tray. 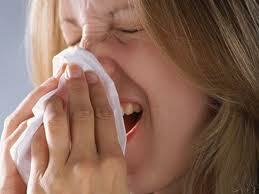 Use hand sanitizers often and wipe down the remote in your hotel room. Buy a portable air purifier. This is the model I have used for years Ultra-Mini. In case you missed this article in the New York Times Travel Section, March 2011. Check list. Day before travel overseas. Why don’t I follow my own advice, and pack and finish all preparations early? Tomorrow I leave for Mexico in a few hours and I”m still crossing things off my list. Here’s my pre-trip “Don’t Forget To Do” list. 1. Call my credit card company to add a “Travel Alert” to my account. 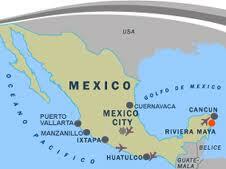 When they see ATM debits and Credit Card charges from Mexico they’ll accept them. I am careful to give the exact dates so they know when I’ll be home. 2. Call my cell phone carrier and add the International Plan. With ATT it cost $4.99 for a month. The charge can be pro-rated, so I make a note to call and cancel it as soon as I get home. Most importantly, I ask how much each minute will cost if I call from Mexico to the USA. How much will text messages cost? I learn that I should turn the phone off, (use Airplane Mode) or I’ll be charged minutes for every phone message and text sent to me. 3. I go into the bank and get lots of crisp, clean $1 bills to use for tips and shopping (when the vendor doesn’t have change). I also take a couple hundred dollars in US currency, which I keep in my money belt or lock in my suitcase in my room, if a safe isn’t available. a rubber door stopper for added security in hotel rooms. Good luck. I hope you can learn from my mistakes. Au Revoir.